It has come to our attention that a deliberately misleading news report has been posted on certain social media sites in Malaysia. The post consists of an old news story which has been doctored by the replacement of the original photo in it with that of our Malaysian-made Bo Ying Compound product which was NOT the product referred to in the original news report. This doctored photo was pasted on top of the photo carried by a news article published on 18 April 2016 and featured on a website Honey99.net. Furthermore, our Malaysian-made Bo Ying Compound product was never mentioned in the news article. Please refer to original news article and the said doctored post in Appendix A. The deliberate and mischievous act of image manipulation is a serious offence intended to create a false and misleading impression of our product and to damage our reputation. We take a grave view of this incident. It undermines the hard work, commitment and dedication of over 135 years of honest effort by our Company, including the high standards of our manufacturing and technology capability which have been recognised and certified globally as well as the acclaimed quality of our products and services. Eu Yan Sang BYC sold in Malaysia is safe for consumption and has never been called into question by the FDA. The product identified by US FDA refers to a suspected version of BYC (HK version) which is in a yellow tin box. The BYC sold in Malaysia & Singapore is in green paper box is safe for consumption. This product has not been identified by US FDA. It is manufactured by EYS Malaysia and complies with all quality assurance & product safety standards stipulated by the Malaysia Ministry of Health. The FDA’s MedWatch report did not explicitly point out that the incident was caused by the consumption of BYC (HK Version). It was presented as a possible link to the incident when investigated by the authorities for excessive levels of lead by the infant’s parents. We stand behind the safety and quality of our BYC product. Should you need further clarification, please contact our Customer Service hotline at 1300 888213. In response to the statement issued by U.S. health authorities that excessive lead was found in “Bo Ying Compound of Eu Yan Sang Hong Kong", the Eu Yan Sang Group has appointed U.S. lawyers to liaise with the U.S. authorities in order to effectively protect consumers’ health as well as our Group’s reputation. The Group has never exported any "Hong Kong Bo Ying Compound" to the U.S. Bo Ying Compound of Eu Yan Sang in the U.S. is produced locally in U.S. in Good Manufacturing Practices (GMP) facilities to ensure that our product fully complies with the quality assurance standards. Bo Ying Compound of Eu Yan Sang Hong Kong is a registered Proprietary Chinese Medicine under Department of Health. Eu Yan Sang Hong Kong’s Bo Ying Compound complies with safety requirements set out by the Hong Kong Department of Health, and has passed all required tests for safety (including lead content). Bo Ying Compound sold in Eu Yan Sang Malaysia Retail Stores is a registered TCM product with Malaysia National Pharmaceutical Control Bureau, Ministry of Health Malaysia. All batches complied with the requirements set by Ministry of Health Malaysia and has passed all the required tests including lead and other heavy metal content, quality standard and stability. Besides routine lab test result on every batch, Eu Yan Sang Malaysia manufacturing arm (Weng Li Sdn. Bhd.) has taken initiative to send sample to external accredited lab to strengthen the result that the lead content and other heavy metals complies to the requirement. 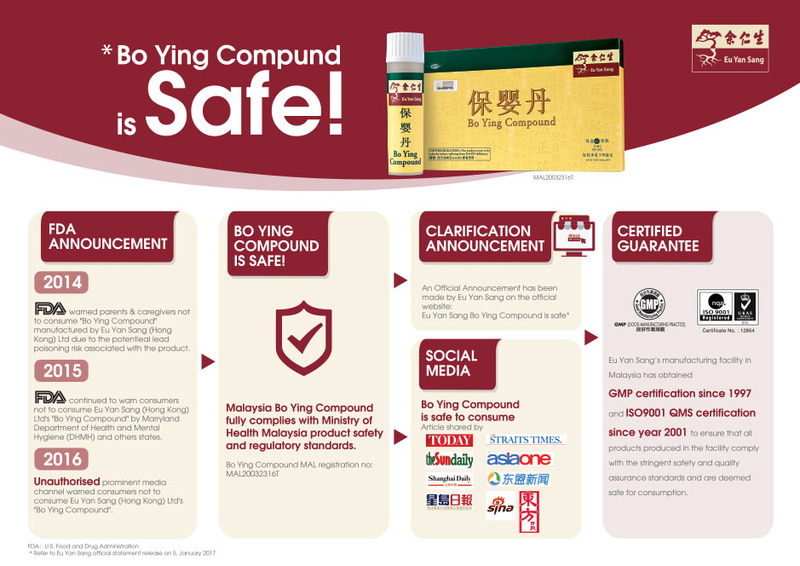 Bo Ying Compound sold in Malaysia Eu Yan Sang retail stores and its authorised distributors is safe for consumption. Eu Yan Sang’s manufacturing facility in Hong Kong has obtained Hong Kong Good Manufacturing Practices (GMP) Certificate, TGA's PIC/S GMP and ISO9001:2008 Certification and the manufacturing facility in Malaysia also obtained GMP certification since 1997 and ISO9001 international accreditation 2001 to ensure that all products produced in the facility comply with the stringent safety and quality assurance standards and are deemed safe for consumption. Bo Ying Compound manufactured by Eu Yan Sang Hong Kong is a registered TCM product certified by Hong Kong SAR Government. This product complies with the safety requirements set by the Department of Health HK, and has passed all the required tests for safety (including lead and other heavy metal content), quality standard and stability. Bo Ying Compound sold in Hong Kong Eu Yan Sang retail stores and its authorised distributors is safe for consumption. In Singapore and Malaysia, Eu Yan Sang’s Bo Ying Compound also passed all tests and complies with the stringent regulations of the respective local health authorities. Meanwhile, we are carrying out further investigations on the health notice issued on 1 August 2014 in New York.